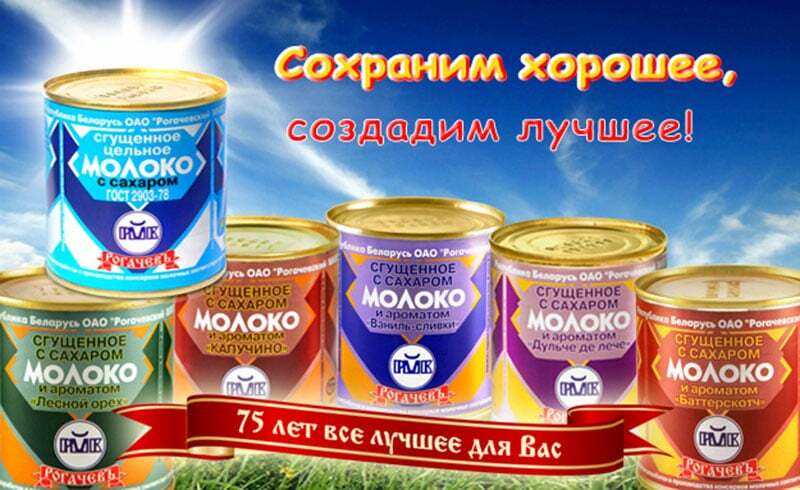 The Rogachev Milk Factory (Рогачёвского МКК) is the largest manufacturer of canned dairy in the CIS. This makes it of particular importance in Russia, Ukraine, and Belarus, where sweetened condensed milk (сгущенка) is a beloved stalwart of the national cuisine. The sticky-sweet concoction is used in a variety of ways: poured over blini, as fillings for sweets, dolloped in coffee or tea, drizzled over fresh fruit or buttered toast, caramelized, used as icing or simply eaten with a spoon. Rogachev’s iconic cans have changed little since soviet days and most new entries to the sugushenka market often try to copy its packaging, hoping to piggyback on its brand recognition. It has been said that, if Andy Warhol had been painting Russian pop culture instead of American, he likely would have chosen Rogachev Sugushenka cans in place of Campbell’s Soup. Rogachev was founded in 1936 to supply the Soviet Union with condensed milk. After all factory buildings were destroyed during World War II, they were rebuilt following the liberation of Belarus, and Rogachev exports dairy products from Russia to this day. Although Russia remains their biggest and most enthusiastic trading partner, Rogachev also supplies products to dozens of countries, including Russia, Armenia, Azerbaijan, Georgia, and Ukraine. In 2010, export comprised 75% of total factory production. Production at the Rogachev factory has grown from 11 million standard cans per year to 120 million, with the ability to fill 600 cans per minute. Despite expanding their product range to include butter, baby food, mayonnaise, cheese, and whole milk; condensed milk still accounts for half of total factory production. Valued for its long shelf life, portability, and nutritional content, condensed milk’s popularity soared as food supplies ran short during wartime and remained a common treat through Soviet times. In addition to the classic sweetened and unsweetened varieties, an assortment of new flavors are available, including cocoa, tiramisu, Irish creme, coffee, chicory, and vanilla.